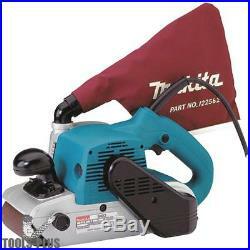 Makita 9403 4″ x 24″ Belt Sander. Add to Favorite Sellers. 1x Makita 9403 Belt Sander. 1x Makita 742322-9 4″ x 24″ Abrasive Belt, 80 Grit. 1x Makita 122562-9 Dust Bag. Makita’s 4″ x 24″ Belt Sander, model 9403, combines power and speed with ease-of-use features and less noise for fast and efficient stock removal. The 9403 is ideal for woodworkers, carpenters, furniture makers, floor installers, deck builders and general contractors who require a best-in-class belt sander. The 9403 features a powerful 11 AMP motor with electronic speed control to maintain constant speed under load, with a 4 wide belt and a speed of 1,640 ft. For fast stock removal. The 9403 also features less noise: at only 84dB, it is one of the quietest sanders in its class. Low noise (84dB) for operator comfort. 4 wide belt with a speed of 1,640 ft. For fast material removal. Labyrinth construction seals and protects motor and bearings from dust and debris for longer tool life. Large front grip is positioned for operator comfort. Innovative design for sanding flush to wall with nose and side of sander. Powerful 11 AMP Motor for High Production Use. Cord is located on the upper portion of the handle for operator convenience. Dust bag swivels 360° for more convenient operation. Belt Size: 4″ x 24″. Belt Speed: 1,640 ft. Cord Length: 16.2 feet. Maximum Speed: 1640 ft/min. Net Weight: 12.6 lbs. Powerful 11 Amp motor for high production use. Belt speed of 1,640 ft. Low noise (only 84db) for quieter operation. Labyrinth construction seals motor and bearings from contamination. WARNING: California’s Proposition 65. Makita Celebrates 100 Years of Innovation. Video will open in a new window. ALL products listed are under the authorization & permission of the manufacturers who make them. We do not break up combo kits to sell the component. BRAND NEW unless they are clearly marked as “reconditioned”. Come in their original packaging (NIB). Tools Plus has been in business for 35+ years and we are dedicated to providing you the highest level of quality service. If you would like us to call you, please send your question along with your name, contact number and the best time to reach you. (Please note: feedback is left once received). An important note regarding Heavy or Bulky items. Non-Commercial ex: residential etc. Destinations “might” necessitate the need for a Lift gate or other additional expenses. These additional expenses are extra cost and you will be contacted for your approval of these extra expenses. You can always ask questions in advance using the Ask a Question feature on this page. Your product’s safety and Your Satisfaction is our priority! Images in our listing are indicative of the product and may vary slightly. Accessories are NOT included unless specified in the listing. We don’t build anything. So please don’t hold against us: color variations nor changes in the products country of origin. Tools Plus sells through numerous outlets, therefore, items may become unavailable unexpectedly. Tools Plus is committed to providing a great customer experience with an easy return process. When you put in a return request, Tools Plus will provide you with a Return Merchandise Authorization. The item “Makita 9403 4 x 24 Belt Sander New” is in sale since Tuesday, January 9, 2018. This item is in the category “Home & Garden\Tools & Workshop Equipment\Power Tools\Sanders”. The seller is “tools-plus-outlet” and is located in Prospect, Connecticut. This item can be shipped to United States.